A dark cloud can loom over us at any time; it can last a day, a week, or even years. The help from a doctor, therapy, or even medication can be a great benefit to many. Exercise is often prescribed to help with the emotional health of a person, but yoga, in particular, has great benefits to those feeling depressed, as the tools it provides to the user can offer some great solace. When we are emotionally down, a contributing factor is often that our life force, also known as “Prana” in Sanskrit, is unbalanced. Yoga can help a person realign the energy that runs through our bodies and can help a person battle his or her depression. How Does Yoga Physically Help? Yoga, a form of exercise of both the body and the mind, helps release endorphins, what doctors call “feel-good hormones.” When you are depressed, the release of these hormones can significantly increase your happiness, maintaining balance out the sadness that you may be feeling. Yoga can help calm the physical body by allowing the practitioner to release any restless energy through exercise, and thus the body will have a better time relaxing once in bed. Yoga is also a great way to calm the mind. When an individual practices yoga, a great deal of focus is needed to maintain the poses or asanas. The Yogi will also need to focus on the breath control, or “Pranayama,” that is used during the practice. This control of your breath can also be used to help calm the mind at night, as when the mind doesn’t want to stop the person can focus on some deep breaths, and it will relax and help bring about sleep more quickly. When a person has had a good night’s sleep, a lot of the negative emotions that are associated with poor sleep will fade away, including those that agitate a person’s depression. Meditation is an integral part of yoga, one that can often be overlooked. 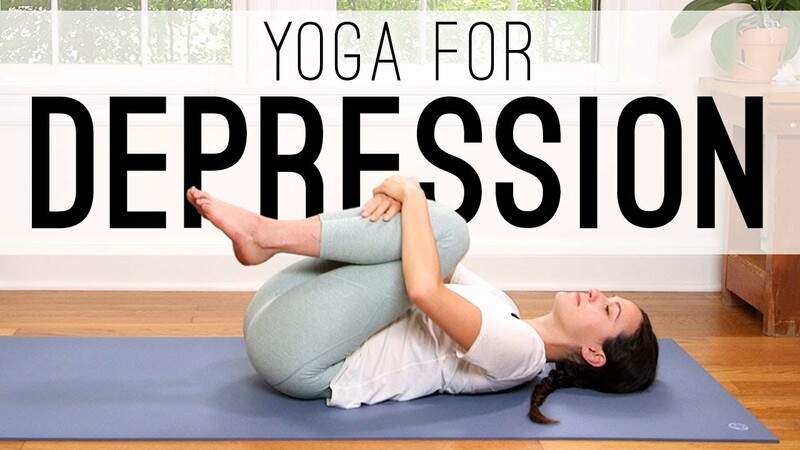 But for someone suffering from depression, this practice can be an essential tool to aiding in eliminating the feelings and thoughts that come from the condition. Meditation requires that you sit in a quiet place and that you tune out the negative energy that comes into your mind. You remain in the present and don’t focus on the past or the future; this can be a great help with eliminating worries that an individual might think about all too frequently. Choose an intention, or mantra, that will aid in bringing positivity to your life. It can be a simple thought, such as “I am enough,” that you can repeat through your meditation, but also throughout the day. This repetition of positive thinking has a way of making us believe that the negative thoughts leading to depression will start to fade. The feelings that a person is worthless, not good enough, or can’t compare to others, often through body image, can bring a person’s self-worth to a low level that can lead to depression. Yoga helps teach the practitioner about self-love, and about self-acceptance. Learning to appreciate all that your body can do for you, as well as to accept you for you, is a great aid in no longer tolerating negatively towards yourself and can help aid in the elimination of depression. Yoga provides a great path to self-healing. It can be added to any other form of therapy or medicine a person might need in the fight against depression. By including yoga in your routine, even when everything else feels hopeless, is a great way to take up the challenge against this debilitating condition.